This new Chinese culture themed video slot is doing the rounds across the internet now, and it can be found in many top casinos offering IGT software. The Dragon’s Temple slot contains your usual symbols (both thematic such as catfish, yin and yang icons, and non-thematic such as high playing cards), as well as a fairly modest wagering range which is rather flexible for once. 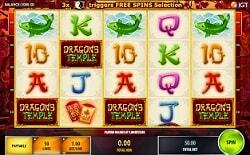 Of course, this new IGT developed slot is all about dragons, and they play a pivotal role in what happens on your spins. As we’ve already touched on, IGT are the developers of this slot machine. They have a history of developing slot machine games which are not very flexible in the wagering department, but they have tried to alter that with the release of the Dragon’s Temple slot. Dragon’s Temple is instead more manoeuvrable than many other IGT games, and it is a feature that we would like to see ported over to other IGT slot machine games in the future. Dragon’s Temple is played over a total of 5 reels and 50 paylines, and it offers players the chance to wager on anything from 10 to all 50 of those lines (in batches of 10 paylines). Players can also adjust the value of their line bets, from a low of just a penny a line, up to $50 apiece. Once you start spinning those reels, you will quickly find that your wagers are falling somewhere between the $0.10 minimum bet, and $2,500 per spin maximum wager, respectively. Wild symbols: There are five wild symbols in Dragon’s Temple, though they aren’t five different wilds. True they have different colours, and they all appear on different reels, but they are the same wilds. The blue, green, orange, purple, and red wilds appear stacked, can extend to cover entire reels at times. They are the best paying symbols in this slot (an hour they share with the Dragon’s Temple logo), and can substitute themselves for all other icons barring scatter symbols. Scatter symbols: Now, the scatter symbols in this game take on the shape of the aforementioned yin and yang symbols. As scatters, they can appear on the second, third, and fourth reels of the slot and count no matter where they fall. You will need to land just 2 to bag scattered cash prizes, and 3 in order to trigger Dragon’s Temple’s bonus round. Free spins selection: Once those free spins have been accumulated, the free spin bonus begins. You will get to pick which one of the three features Dragon’s Temple carries you want to play. One option could be to go with the 15 free spin with a wild third (central) reel on every spin. The second option offers 10 free games with wild reels on the second and fourth reels. Alternatively, you might opt to go for just 5 free spins, and having the first, third, and fifth reels wild throughout the game. Players have two very distinct symbols which can offer you jackpot wins. On the one hand, you can spin and win with the Dragon’s Temple logo, whilst on the other you can win with wilds. Both symbols can offer you wins worth up to 20x your total bet. This small-prize happens to be the non-progressive jackpot in this slot. So far, Dragon’s Temple sounds like it might charm the socks off you, but let’s not be too hasty. This slot’s non-progressive jackpot (a meagre 20x your total bet) is laughable, and is scarcely worth your time. Players simply aren’t going to be won over by such a piddly, and pathetic jackpot prize. If you are going to do the hard work and manage to land 5 symbols on a line, you will want a considerably better prize than that. Dragon’s Temple does offer a great wild structure, and we have to say that we love the flexibility with the wagers, but is it enough to win IGT any plaudits for Dragon’s Temple? Probably not. It’s not that Dragon’s Temple is specifically a bad game, it is just that there are better slots out there with similar themes and more to offer in the jackpot department.